You are a catalyst of change. 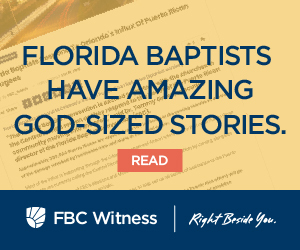 As a catalyst, you are sparking momentum and that has been growing with Florida Baptists and the Southern Baptist Convention to change hearts in the state and the nation. You have made it possible to send 51 percent of all Florida Cooperative Program funds to reach the nations. With a $30 million Cooperative Program goal you are sending 7.7 million to empower the IMB to fund more missionaries families; $3.48 million to NAMB to plant churches; and $2 million to help Florida Baptist churches plant and revitalize churches. This year with the Cooperative Program materials, we are offering you a fresh approach and a different delivery mode, partnering beside you to put resources in your hand.